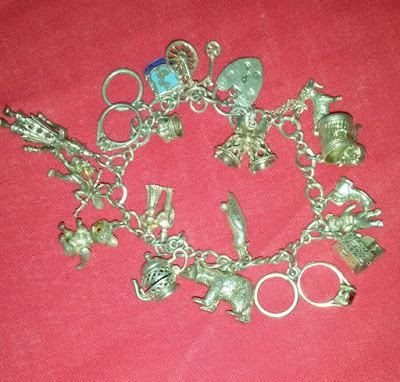 My husband bought me a Links of London sweetie charm bracelet about 7 years ago now - I had always wanted one after spending hours and hours as a child playing with my mum's charm bracelet, inspecting all of the different parts and asking her to tell me the story behind each one. She had some really fun charms with moveable parts which I loved - such as a teapot which opened and closed and a little cat climbing into a bin which reminded me of a cartoon I'd once seen and will always stick in my memory! 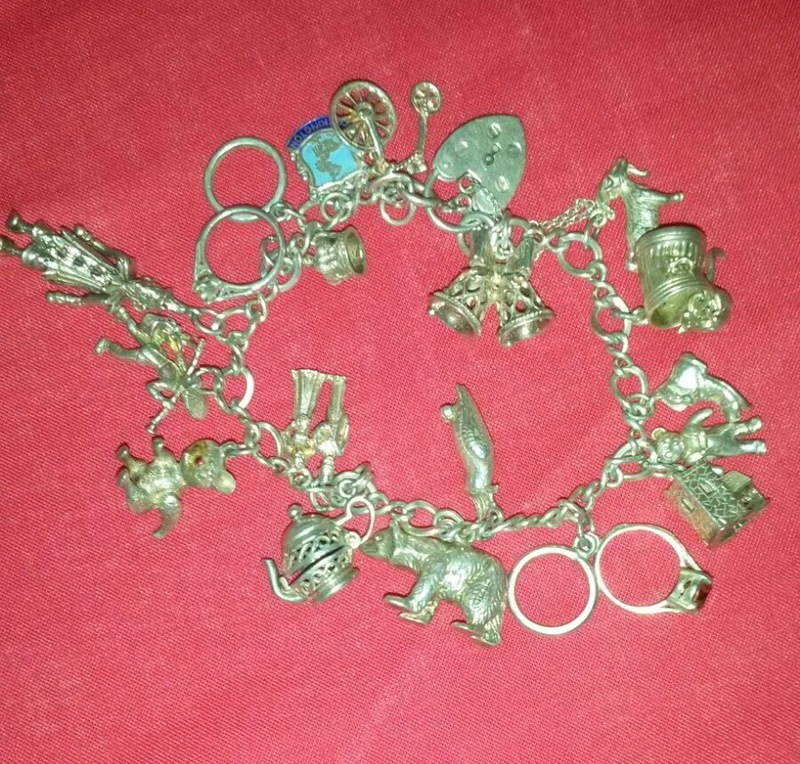 I used to love sneaking into her jewellery box just to have a look at her charm bracelet and I always imagined my own children doing the same thing one day with mine. It would seem rather fitting, therefore, that the one charm on my own bracelet with moveable parts is from my mum! She bought me a little pink doll who's legs can be moved because it reminded her of a doll that I had and loved as a child! I also used to be obsessed with the colour pink as a child and so I don't think there could have been a more appropriate charm that my mum could have chosen for me really!! 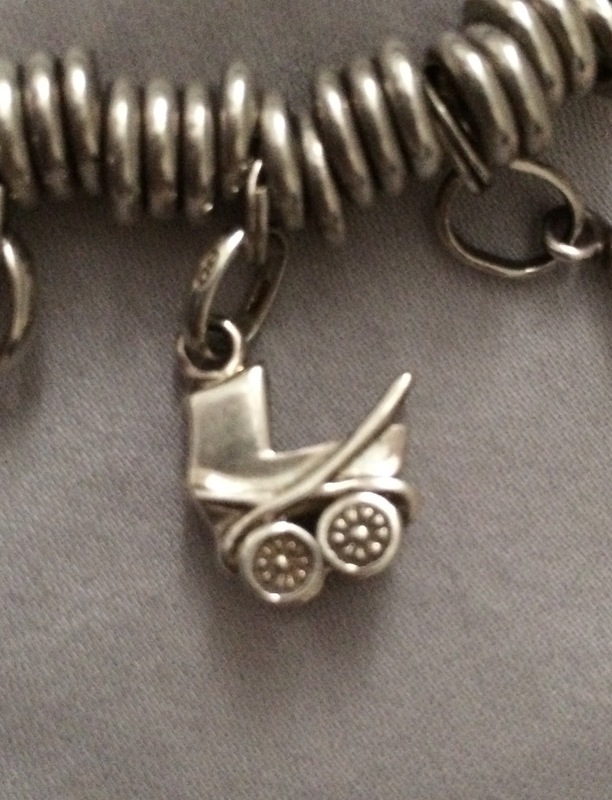 The first charms I received for my bracelet were from my husband. He bought me the letter 'S' for my name and a love heart. Last year, the heart was added to with a smaller 'mother of pearl' heart from Arthur (my son) for my 30th birthday. Pearl is my birthstone, and so my husband also got me a charm for my 30th which had a pearl inside - a little silver seashell! We spent my 30th birthday on holiday in Spain with my twin sister and her other half, so this is a lovely reminder of our holiday too! Back in 2008/2009 after the recession hit and the company I worked for went into administration, my husband was seconded to London for a year. Having no job myself and wondering what direction to take my life in next, this was great timing for us. I stayed behind in Ilkley for a few weeks packing up our house and putting our belongings into storage before setting off to join him on our London adventure! We rented a one bedroom flat in Balham and I took everything I thought I would need in one suitcase. At first I craved fresh air and countryside and I couldn't get used to the sound of the foxes at night time, but after a few weeks the work life balance felt great! 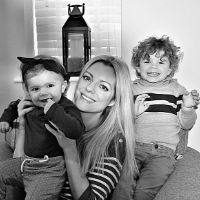 I'd decided that now was the time to pursue my dream of working with children and so I got a job as an early years practitioner in a private nursery in the mornings and then worked as a Nanny for 3 girls (aged 2,5 and 8) in the afternoons/early evening. Their mother was originally from a town in Notts where I grew up and it all felt like it was meant to be. I loved it and we were desperate to stay. Thomas (my husband) had been given the option of a permanent job in London and just as I had started to apply for teaching training places down south he was sent back to Leeds due to a sudden and urgent need for his skills back up North. We'd always planned to move back eventually when it came to starting a family, but we really hadn't wanted our London adventure to end when it did. 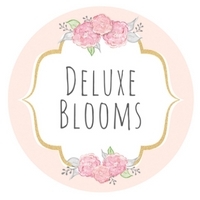 The London taxi charm symbolises this time in our lives, one without which I probably would never have gained a place on a PGCE because of the requirement of work experience with children beforehand. You'll probably have guessed by now that my next charm, the wise owl in the graduation hat, was bought for me when I qualified as a Teacher after completing my post graduate degree. My undergraduate degree was actually in Law and this is how I came to meet my husband, but I knew quite early on that the life of a lawyer wasn't really for me, and even if it had been - I couldn't afford the additional training after university. I worked as a Legal headhunter for a few years, saving up for whatever I decided to do next, which was of course - training to be a Primary school Teacher specialising in Early Years. I didn't go back to my Teaching role after having Arthur, even though I had planned to. It can be hard sometimes knowing that some people may now think of me as just 'a mum' and this charm helps to remind me that actually, I am a lot more than that. I've had two successful careers and this stage of my life is just a new priority to put my best efforts into. When I had my hen do, my two sisters bought me the dippy egg in an eggcup (some do mistake it for an ice cream with a flake!) not just because I LOVE dippy eggs, but also as a little nod towards a game we used to play when we were very young (promise!) called 'chicken and egg'. I'm definitely not going to tell you how to play this game, I'm not sure they would forgive me!! It was a lovely symbol and reminder of my childhood as I prepared to be 'given away' on my wedding day. I had fallen in love with the blue topaz 'cloud with a silver lining' charm a long time ago. I loved what it stood for and I thought it was a lovely reminder to be positive in difficult times. On my wedding morning Thomas had left me a letter and a gift - my 'something blue' for the wedding day - this charm. It was completely unexpected and I couldn't believe he'd taken notice of how much I had loved and wanted this charm. My Mum immediately burst into tears when she saw me open it and sobbed "he really loves you!" (Thank god I thought, it is my wedding day after all! lol) I thought it was really clever to save it as a wedding gift and it is my favourite charm out of them all. I tied it to a ribbon inside my wedding handbag and kept it with me on the day. Finally, I come to the baby carriage. No prizes for guessing which life changing event required this additional charm! I think Thomas had been planning on giving me this one for Xmas as Arthur was due on the 23rd December and I was so big we were sure he would come early! In fact he was 15 days late so we were well into January when he arrived...pretty sure there was some last minute panic buying of a new gift for Xmas day around the time of the original due date!! I can't wait to see what charms I get to add to my bracelet in the future...looking at Donna's and the photo of my Mum's I definitely have space for a few more!! 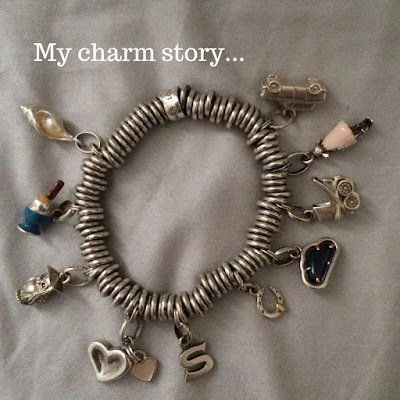 To carry on this charm story I am nominating Jada and Naomi to write about the story of their own charm bracelets. awww this reminds me of my LOL charm bracelet and how I should get it out and wear it again! I also have a letter for my name - E and a letter for my sons - B. and a cat - I like cats. and that is it! I need more! love your little wise owl and blue topaz cloud is adorable!